The No. 13 Vaillante Rebellion LMP2 team, which finished third overall at this weekend’s 24 Hours of Le Mans, fixed their car’s starter problems by hitting it with a hammer. 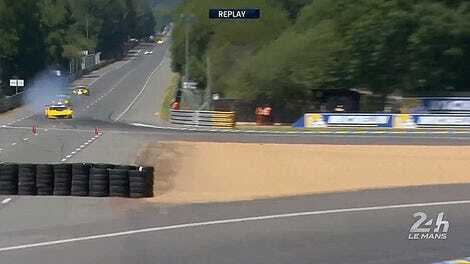 Today, the team was disqualified after they were caught red-handed trying to cover up the hole they’d made to hit that starter faster during pit stops, as the hole wasn’t allowed by Le Mans’ regulations. Starter problems began to plague the No. 13 team in the final hours of the race, where replacing the starter entirely was a lengthy swap they weren’t willing to take on. A mess of a stop to try and fix it gave the No. 13 a stop-and-go penalty for performing work on the car with the car’s engine running. This was devastating, as the car couldn’t start back up without much help. So, they began hammering on the starter. 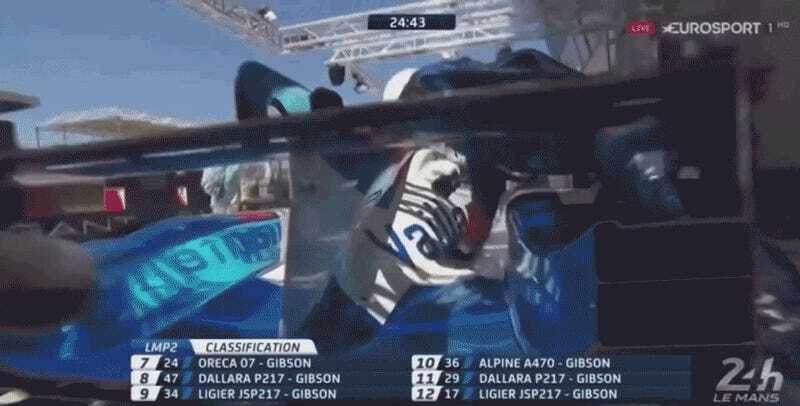 In order to do this without having to remove the rear engine cover, they drilled a hole through their LMP2-class Oreca 07-Gibson’s bodywork. You could even see the hole in use on the broadcast of the race, plus what appears to be a guy holding a white square that may or may not have been intended to go over the hole. To the technical marshals who checked over the car after the race, this hole was an unapproved modification to the LMP2 bodywork. This seems a little harsh given that the hole only existed so their car could stay in contention in the race. That being said, the team seems to have known they were in violation of the rules, as No. 13 team manager Bart Hayden told inspectors that he had told the crew to cover the hole with bear bond during the one of the car’s last pit stops, per Racer. That never happened during the race. Caron and Vaillante Rebellion team member Ian Smith, who was attached to the car while in Parc Ferme, then had an exchange. Having one of your team members act like he’d just gotten busted with his hand in the cookie jar by trying to remove what he’d just put on the car really, really doesn’t help. As a result, the Automobile Club de l’Ouest who hosts Le Mans disqualified the car for modifying the LMP2 body as well as for unauthorized intervention in parc ferme. While the No. 13 team indicated to the ACO that they plan to appeal to the stewards to get their race finish back, that appeal doesn’t sound very promising. Hayden was unable to give any reason why his mechanics were in parc ferme to Racer, and they got caught in the act trying to cover up what they did. That’s a shame, as it was fascinating to watch a car with a technical issue make it onto the third place overall as well as second place in their class. That third overall podium spot now goes to the No. 37 Jackie Chan DC Racing car, who also moves up to second place in LMP2.